the imitation of treacherous people. As I sit here so blissful, meek, and enlightened. Looking at him you’d see this big, bald Mexican guy. He’s intimidating. But underneath he’s so sweet and thoughtful. You’d never suspect that he writes deep, beautiful poetry. I love him to death. This is the 2nd page I did on October 26th (see my previous post about getting back into scrapping). It was for the Saturday Scraplift at designerdigitals.com. 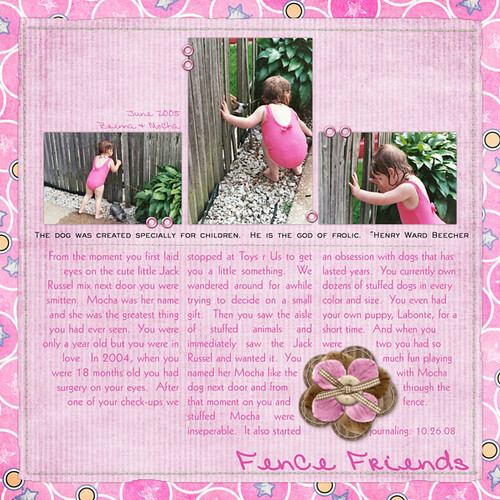 I don’t usually put a lot of journaling on my pages but I felt compelled to tell the story of my daughter’s love for the neighbor’s dog and how it led to an obsession with stuffed dogs. She was 2 1/2 in these photos. She’s going to be 6 next weekend. This is my latest page. I did it the other day based on sketch #100 at pencillines.com. I usually don’t do circles because I can’t ever seem to get them to look right. This layout took me most of the day to complete. I just kept adding more and more circles. I went through all my stash and found all sorts of circles to use besides cropped papers. The pictures themselves are of the girl across the street. She is really good at the hula hoop and can spin that thing for 20-30 minutes without dropping it or stopping. She won the hula hoop contest at our block party on August 30. I have been trying to work out a story idea for this year’s NaNo novel for awhile now. I had pretty much decided to just do a fanfiction I had in mind (actually started writing an outline for it and I never do outlines). So I was just sitting there thinking of stories and how I was always told to write what I know. I’m like, “what do I know. My life is boring; I’m just a stay at home mom,” and bam! it was like getting hit with a brick or something. This is the short version of the idea that just sprung to mind. I felt compelled to write it down before I forget. Courtney is a 30 something SAHM to (several kids, haven’t decided that yet) who is bored and lonely in her life. She has the husband, who is a nice enough guy and loves her, the house and the SUV. She has the “American Dream” but still feels something is missing. She lives vicariously through her best friend, Lucy (just picked that name out of thin air this very second) who is a 20 something that seems to have it all. She is smart and beautiful and successful and lives this romantic, wonderful life that Courney never had (even when she was single). Things change when a handsome, charasmatic guy moves in next door to Courtney. He is a single dad with a little girl and instantly becomes the center of the neighborhood. All the other moms on the block flock to him to “help” him with his daughter and to try and get a chance in with him. Courtney finds herself attracted to him and the two start a tentative friendship while talking over the fence when their kids are playing. This confuses Courtney who thought she was happily married until that point. Meanwhile Courtney’s brother finds himself living on the couch in her basement after a falling out with his girlfriend and flunking out of college (again). The re-insertion of Kyle into Lucy’s life throws her for a tailspin. She had a huge crush on Kyle all through school but never said anything, not even to Courtney. The two start hanging out and Lucy realizes she still has feelings for Kyle which is especially unnerving when Courtney tells her that Kyle confessed to having feelings for Lucy back in school, too. Meanwhile, Lucy’s grandmother is going through a late-life crisis as she finally leaves her abusive husband and starts a fresh life. The sudden divorce shatters the family and Lucy finds herself standing at her gramma’s side against her parents and other relatives. Things are complicated when Gramma Dee falls for a younger man she meets at a free-thinkers gathering. The family thinks Dee is going crazy. Lucy sees her grandmother as a strong woman, taking control of her life and realizes how out of control her own life really is (despite the look of total control she portrays to her friends). Will Courtney take the plunge and jump into an illicite affair with the gorgeous and easy to talk to neighbor next door just to see if she is missing something? Is it a moment of clarity in life for Courtney or a case of “the grass is always greener on the other side”? Will Lucy get past her commitment issues and let herself have the relationship with Kyle that she had longed for as a teen but was too afraid to act on? Will Gramma Dee find true love or just tie herself to another abusive jerk because she can’t be alone? Hmm, most of that I made up on the fly as I was writing this (like the whole character of Gramma Dee). So, yeah, write what you know. I just finished this one. It’s about my best friend growing up. We don’t talk much anymore because she’s a busy 26 year old career woman (teacher) with a life and I’m a 31 year old stay-at-home-mom with no life (hence why I’m online blogging at 12:45am instead of…well, anything else). I love her to death, though. We’ve known each other for almost 20 years and she is more like a sister then anything. Even when we haven’t spoken in forever we can pick up like we never left off and finish each other’s thoughts.